July 29, 1927 - July 7, 2018: Barbara will always be remembered for her poetry and as a positive person, and she always had a smile. Barbara Bigham 90 passed away peacefully in Reno, Nevada on July 7, 2018. Barbara was born in Portland, Oregon on July 29, 1927 to Hugo and Hulda Skans. She attended Oregon State University and graduated with a B.S. in Sociology from University of Oregon. She worked as a Camp Fire Director, U.S. Bank Teller and a nursery school teacher. Barbara met the love of her life Dale and spent her adult life in Eagle Point, Oregon as a housewife on a family dairy. 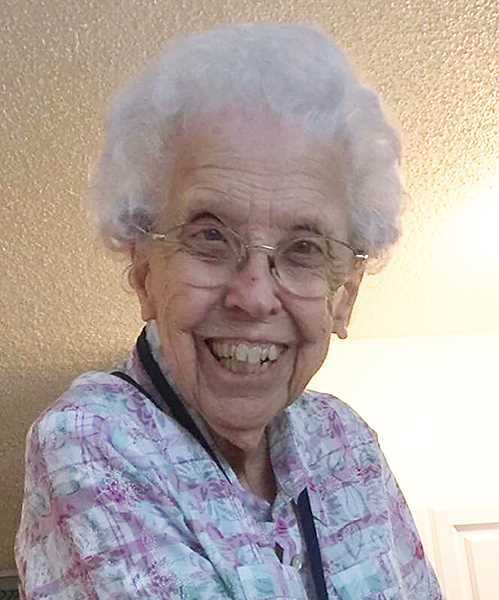 She loved family, church, children of all ages, being a homemaker, wife, mom and grandma. She will always be remembered for her poetry and as a positive person, and she always had a smile. Proceeding in her death includes her beloved husband Dale, and brother-in-law Robert Weinman. She is survived by her sister Janet Weinman, son Steve (Lori) and grandchildren Jeffrey and Matthew. A service will be held at 11 a.m. Aug. 24 at Immanuel Lutheran Church in Woodburn.